The Juice Pack Access provides what the company calls “advanced impact protection” for the Apple iPhone Xs Max, iPhone XS, iPhone X, and iPhone XR. Additionally, it features extra battery, Qi wireless charging compatibility, and full access to the iPhone Lightning port. Mophie claims that the new case will provide up to 31 hours of total talk time. Additionally, the pack itself can be charged with a USB-C charging port, while the phone itself can be powered up with the Lightning port. 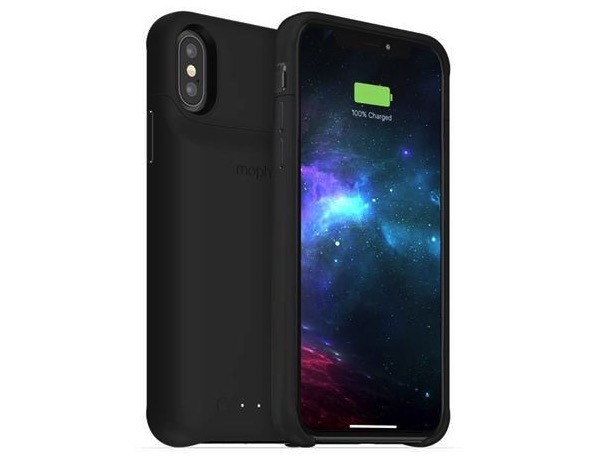 The Mophie Juice Pack Access will be available in the first quarter of 2019 on mophie.com for $119.95. Colors available include black, stone, gold, and dark red for the iPhone XS Max, iPhone XS, and iPhone X, plus black, blue, and red for the iPhone XR. An icon found in watchOS 5.1.2 showed off a new Apple-produced Smart Battery case that featured a vertical camera cutout such as that found on the latest iPhones. The updated case has a similar design to the original, but lacks the extended “chin.” Rather, the new case extends only minimally from the bottom of the iPhone where it connects to the Lightning port. Apple’s case has yet to be announced. AppleInsider will be attending the Las Vegas Consumer Electronics Show starting on January 8 through January 11 where we’re expecting 5G devices, HomeKit, 8K monitors and more. Keep up with our coverage by downloading the AppleInsider app, and follow us on YouTube, Twitter @appleinsider and Facebook for live, late-breaking coverage. You can also check out our official Instagram account for exclusive photos throughout the event.